Taking photos of lovely subjects ranging from nature, people and objects would make one feel happy because aside from being able to capture the beauty of the subjects, he is also creating his own artwork. But some people do not just take photos of what they can see everywhere. Some prefer to “create” their own subjects, making it unique and totally personal. This multiplies the feeling of happiness because it is not just the camera’s lenses that do the job but even the artist’s heart, mind, and hands. Many photographers attempted to create their own subjects to come up with distinctly impressive results. And today, we are going to show you one photographer who did just that. 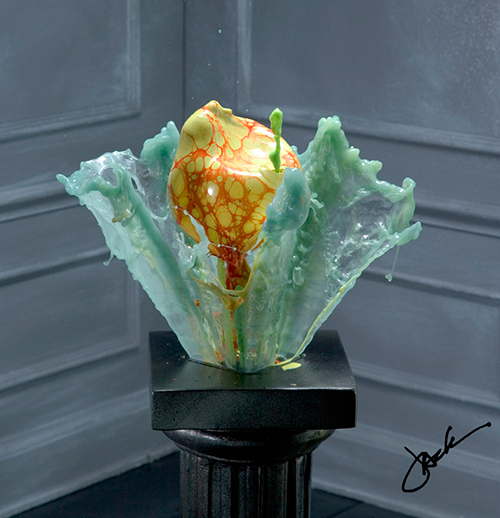 Jack Long is a photographer known for his liquid sculptures or fluid suspensions. 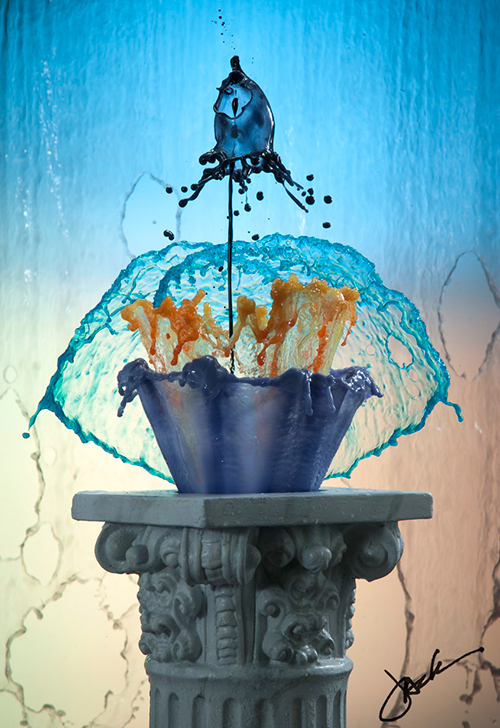 These are high speed photographs of colored water done with a series of captures before a final output is made. 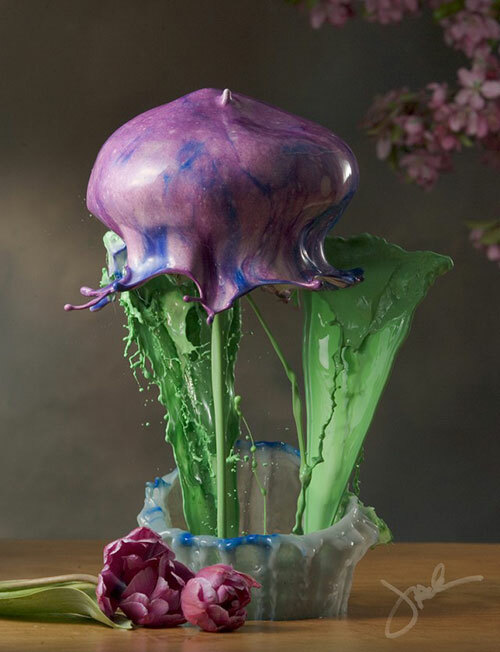 Although his works fall under splash photography, Jack refers to call his works as liquid sculptures or fluid suspensions. He also added that, “The “splashing” generally occurs very shortly after the exposure is made. 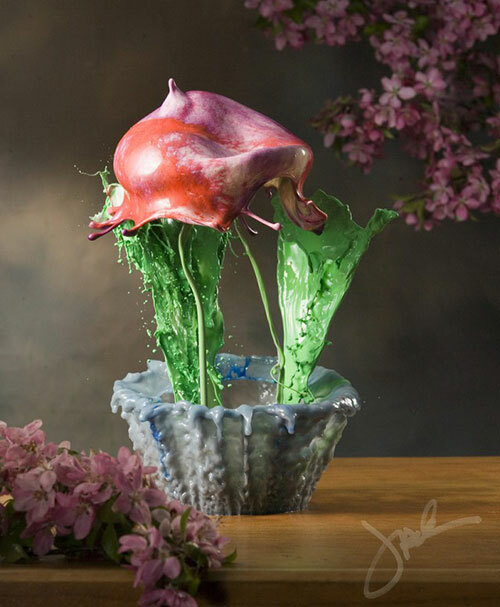 I try to create dimensional forms and shapes with liquid in space using various techniques and capture them at the peak of aesthetic action.” Who would have thought that liquid can actually mimic the look of flowers? Well, Jack Long was able to perfect that with a trial and error method. But his efforts are always worth it because the results are undeniably fascinating. Jack Long: I am from a city in southern Wisconsin, I went to college in Milwaukee for photography. I have remained in Milwaukee for most of my career. As a professional I have had the opportunity to photograph a very large variety of subjects. My concentration has been primarily tabletop and studio advertising photography. I have been a professional photographer for about 35 years. Naldz Team: How did your passion for photography started? How long have you been in the field? Jack Long: I have had a camera for creating personal images and exploring photography for nearly 40 years. It was one of my first major purchases as a young man. I loved to explore all matters of natural, urban and family subjects. As a young artist I have also painted, worked with ceramics and other artistic media. 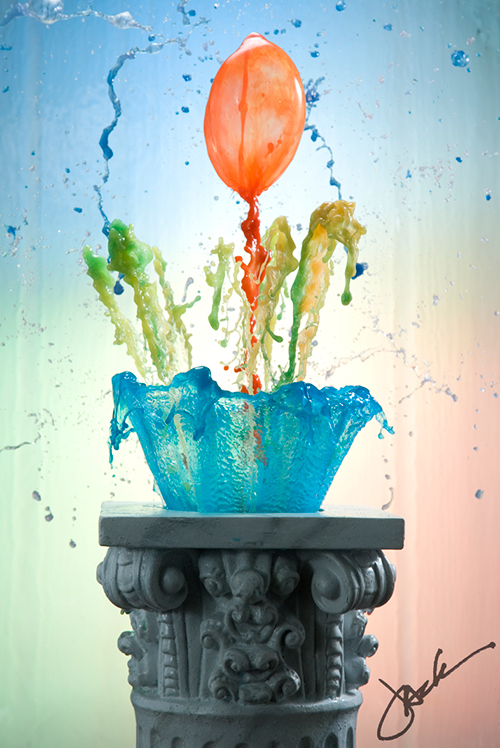 Naldz Team: Before you worked on your high-speed splash photography, what were you working on at first? 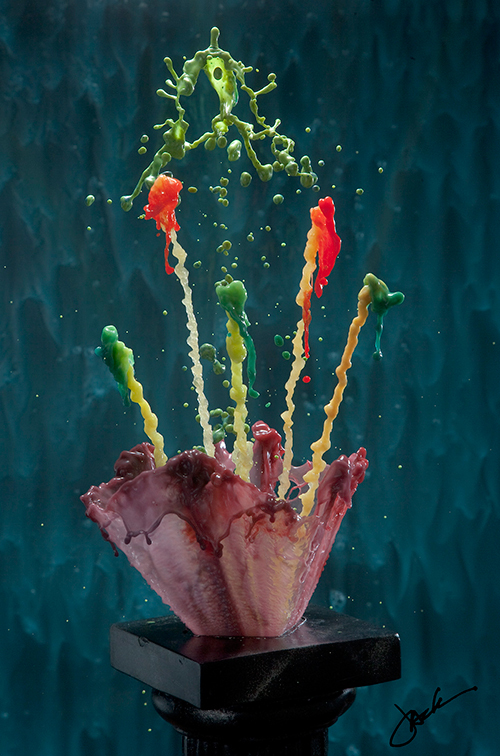 Jack Long: Prior to working with high speed fluid photography I explored landscape and macro nature, both outside and in studio. I attended workshops for nature, landscape and creative image making. I found them to be very helpful in developing my eye and technique. 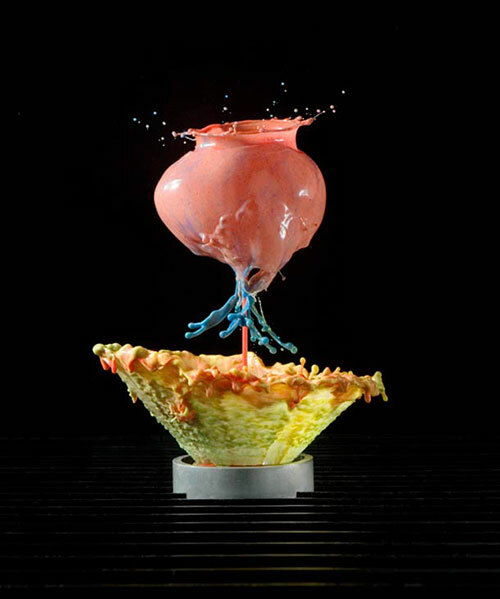 Naldz Team: How did the idea of liquid sculptures and liquid flowers conceived? Jack Long: I also did other beverage studies in the studio using a special table that I had built. They were very popular with the gallery I was in and when I was participating in local Art Fairs. When sharing the beverage images with an associate we discussed other ways of using fluids for other commercial products. I built a device to deliver water to the product for a more traditional splashing effect. 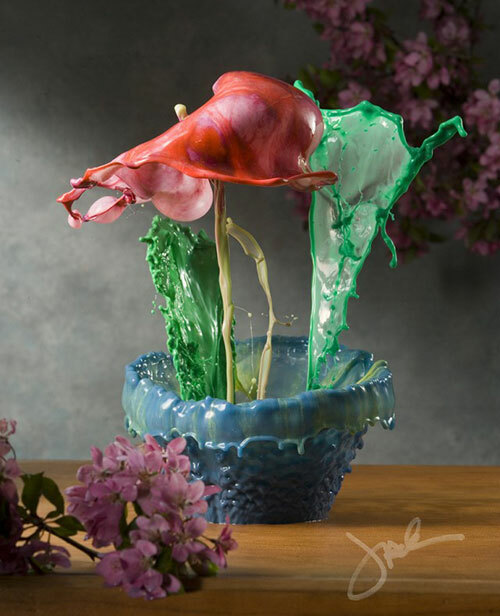 When I tested the apparatus, I discovered the mushroom forms that it created and that began the latest experiments that have led to flower shapes and a wide variety of other image possibilities. Naldz Team: How many tries do you need to take before you get the perfect shot? Jack Long: I begin with a concept of what I want to create visually and then I construct the sets and devices required to produce them. It takes a significant amount of time to construct the set ups. 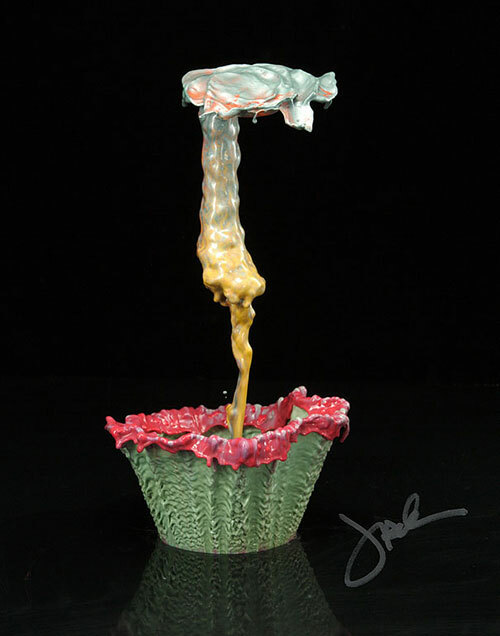 I then begin to test with water to refine the forms and timing. I will shoot tethered into a laptop computer refining the work as I go. Once I get the effects I want, I begin to introduce color and texture into the forms. It will take hundreds of captures at times before I am satisfied with the results. Sometimes I’m not satisfied, and I will redesign or change directions. Naldz Team: Can you share to us your process in achieving such amazing photographs? Naldz Team: What equipment do you use for your photography? Jack Long: The equipment I use is a Canon DSLR along with a variety of lights and modifiers. I began using Vivitar 283’s hard wired and triggered with a radio slave. I recently acquired two Paul C. Buff Einstein units. They have significant light output and very short flash duration. Naldz Team: What were the challenges you faced while mastering splash photography? Jack Long: The major challenges have been everything from having enough light output to technical issues of timing and construction. I would love to be able to have higher resolution images, but I have enlarged to 24”x30” with good results. Naldz Team: What lessons have you learned during the process? Jack Long: I have learned a great amount about the intricacies of high speed flash capture as well as better methods of controlling the fluids before, during and after exposure. I began with rather basic mechanical devices and have progressed to using more advanced apparatus including digital timing and automation. Naldz Team: Your works has impressed many art and photography enthusiasts. How did this affect you and your photography? Jack Long: I am pleased that my work has been so well received among the photography and art blogosphere. I am encouraged by the support and being unique has driven me to advance my techniques. At the moment I am trying to assess how it fits within the more narrow definition of “fine art.” I am reading more about what is required to be getting the attention of curators and gallery owners. So far it has been a very mixed range of reactions. I am not certain at this point where in the art world the work would sell best. I have entered a small number of competitions and have had mixed results. I have set up a web site to display and sell and I also have an artist page on Facebook. Naldz Team: Do you have photography heroes whom you look up to for inspiration? Jack Long: I do not have any particular photographers that stand out as favorites. I admire anyone who makes great original images whether past or present. It would be an oversight not to recognize Harold Edgerton for his work with strobe photography. Naldz Team: When you are not working on your splash photography, what else are you occupied of doing? Jack Long: Creating the work has been a bit of an obsession over the last few years, so I don’t indulge in many other recreational activities. I do work full time as a catalog photographer and I do work on the upkeep of my home, but mostly I am focused on what I’m working on and what I can do next. I do my larger set work in my garage at home, so when it’s either too cold or too hot, I can’t stand the discomfort. This summer, I have been doing some outside work within the river that borders my home. That helps on the hot days, when it’s too cold I work smaller sets and tests in my basement. It would be nice to have a studio space, but maybe if things start to sell. Until then it’s working well. Naldz Team: Can you give us your own definition of photography? Jack Long: I can’t define photography in any way other than it is the optical capture of an image with the use of optics and light sensitive receiver. Not all photographers actually use cameras in the traditional sense, but most are working with light sensitive materials or technology. It is that image that matters most. It should be aesthetically pleasing or evoke some reaction from the viewer of the work. It should work within the general constructs of composition and light quality. Color, tone, texture and other elements combine to add to the image qualities. Naldz Team: What advice can you give to aspiring photographers? Jack Long: The world of photography has changed dramatically in the time that I have been practicing. I would not encourage any young photographers to be confident that they can obtain a well-paying job creating photography. There are a few of us lucky enough to be working in the field but the jobs have become less common. I would however not try to deter anyone form creating photographic images and discovering their own paths within the art. Someone has to be the image creators of the future, but the added knowledge required to make a living at it is more than before. Technology is so much more a part of what we do every day. Knowing computers is a must, hardware and software. More images are “moving” these days with the addition of video in cameras and even phones, so knowledge of cinema techniques and again software would be beneficial. The use of CGI and computer graphics is becoming more affordable and more prevalent. Knowledge of computer graphics also adds to the number of tools that an image maker can use. Without forgetting of course the importance of light and composition as well as knowledge of graphic design. With real flowers as accents, this set-up sure is stunning! 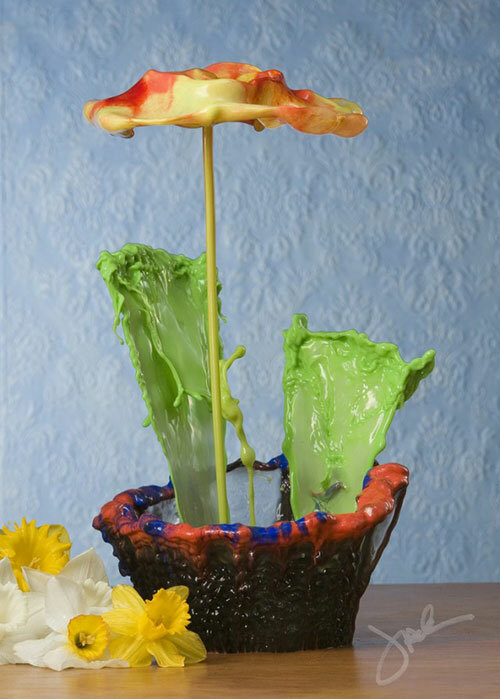 Shades of green and red combined creates a floral liquid that seemingly grows from its vessel. 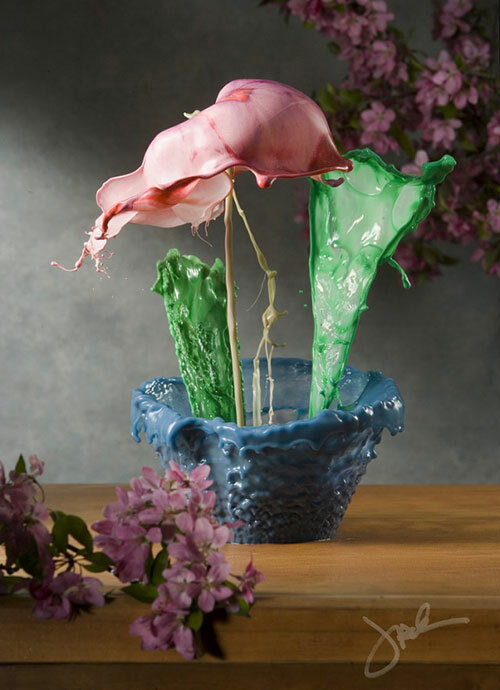 This liquid sculpture sure is lovely. Its beauty is even enhanced with the flowers in the setting. A black pedestal was used for this one to make it look like a real solid sculpture. Another work on an intricate pedestal. But your eyes will surely be drawn to the lovely liquid sculpture above it that seems to fuse fire and ice in its combination of colors. It is just sad to think that this stunning work would not be physically visible for it would vanish in seconds. Good thing the camera and Jack Long is there to preserve this divine beauty in photographs! This one is lovely especially with the smaller droplets of water which gives it some pretty details. It is indeed amazing how colored water could look as gorgeous as this! Even the stems and leaves were planned well to get a perfect output like this. A humble work of art whose beauty can never be replicated for they only exist in a blink of an eye! 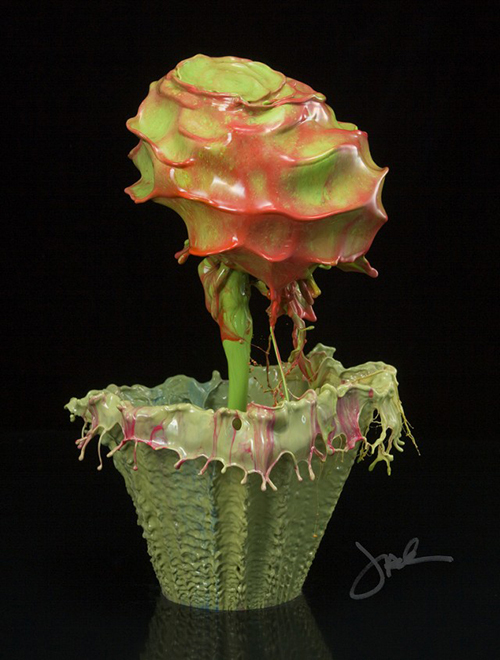 One look at the photos above would make you think that these are exotic flowers but no, these are the amazing liquid sculptures of Jack Long. We know you are impressed, so why don’t you head over his website to see more of his works? There are actually more unique works that you can see there. The list we have here is short but this sure is enough to tickle your curiosity about these flower jewels!